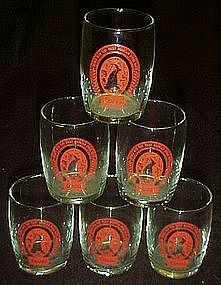 Vintage 3" tall glasses with the Coors logo of the rocky mountain stream in red enamel. The glasses are made by Libbey and are not thick. The perfect size to have a quick frosty beer from. I have 6 available and all are perfect. The graphics are crisp and bright. Price is for each.